Dwelling of a Coffee planter, Ceylon. bl.uk > Online Gallery Home	> Online exhibitions	> Asia, Pacific and Africa Collections	> Dwelling of a Coffee planter, Ceylon. 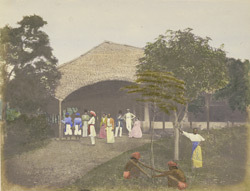 Photograph by Frederick Fiebig from an album of 70 handcoloured salt prints, of the dwelling of a coffee-planter in Sri Lanka (Ceylon). Fiebig, of German origins, was active in Calcutta as an artist and lithographer in the 1840s. Little is known about his life, but turning to photography in the late 1840s he produced hundreds of photographs by the calotype process, frequently handcolouring them. His photographs of Ceylon, probably taken in 1852, are considered the earliest surviving photographic record of the island. Although today known for its tea exports, the mainstay of Sri Lanka's economy was once coffee. The Dutch experimented with seedlings from their Javanese plantations, but the coffee crop did not grow well at the lower elevations of the coastal regions. It was the British who successfully commercialised coffee in Sri Lanka with their access to the interior. The higher plateaus and peaks were rapidly annexed and deforested and by 1867 coffee covered over 100,000 acres of the island's hill country. In 1869 a leaf disease spread through the plantations and this famous 'coffee blight' ravaged the coffee crop and forced the British to focus on other crops they could export. As a result, the decimated acreage was converted to tea-growing. Planters lived in style in splendid isolation on their vast plantations. Arcaded verandahs, as seen in the picture, protected the main dwellings from monsoon rains and the glare of the sun.